Shoppers’ favorite sale is always the day after Thanksgiving sale, a.k.a. Black Friday. Make your holiday shopping list now and get ready! 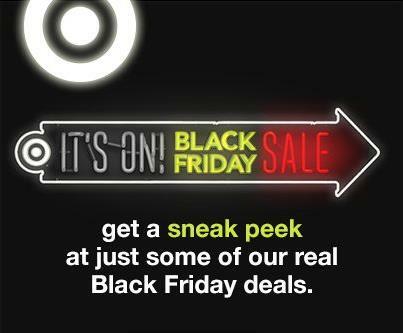 Here’s a sneak a peek at Black Friday doorbusters now & shop online exclusives on 11/22. Targer Black Friday Sale begins Thursday, Nov. 22 at 9 p.m and ends Saturday, November 24. This means you’ll get earlier-than-ever access to incredible doorbuster deals, and you’ll find even more ways to save on the season’s hottest gifts. Quantities are limited. New Bonus Doorbusters at 4 a.m.
Dec. 24: 8 a.m. to 9 p.m.
Dec. 26: 7 a.m. to 10 or 11 p.m.
*Varies by location; guests should visit Target.com for their local store’s schedule. Remember that there will be special offers online and great deals that are only available in store, so go ahead and make plans to shop both! Black Friday 2012 is going to big, because in 2012, it falls on the earliest possible date, November 23. Having Thanksgiving and Black Friday fall early in 2012 will provide shoppers with more days to shop at Target and Target.com before Christmas. Get started now. Shop the Black Friday sales and score great Black Friday deals. Previous Post: « Boosting My Immune System with Conzace!